Time - The HITEC Foundation mentorship program looks to connect young Hispanic technologist with executives already in the industry who can mentor them through their collegiate and early professional years. If you are interested in volunteering as a member please click here to learn more and to apply. Connection - Be a champion of Hispanic youth at your organization by lobbying for slots for HITEC Foundation candidates within your internship program. If you are interested in signing your organization up as an internship partner please click here to make that connection. Funds - Although enrollment of Hispanic students has increased in recent years the data shows that there is a significant gap in degree completion due to lack of support and guidance in developmental education requirements and conclusion of gatekeeper courses. The HITEC Foundation looks to close that gap by providing not only mentorship and internship support but also financial aid. In 2018 the HITEC Foundation will give out 20 scholarships to well deserved students many in the final year of studies. Unfortunately 15 qualified students were denied financial aid due to lack of funds. Please help us change that story. Below are three ways you can donate funds to the HITEC Foundation. Join the Movement by Donating Today! Access our donation form online at http://bycell.co/dtcd. Thank you for choosing the HITEC Foundation to kick off the charitable season. 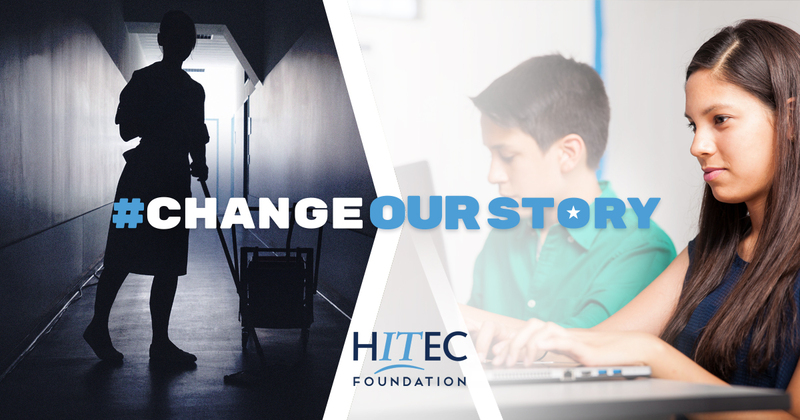 #ChangeOurStory is a movement to unite Hispanics to join together to change the way our story is being told through education and awareness, and we are just getting started. Please help us by reach our goal by encouraging those people you may know who want to donate to a meaningful cause before the end of the year to chose the HITEC Foundation.